In a large nonstick frying pan over medium high heat, add the oil and heat until shimmering. Add the potatoes, onion, garlic powder and onion powder to one side of the pan. Salt and pepper, if needed. Add the chorizo sausage to the other side and sauté until cooked through, breaking up with the back of a spoon, about 5 minutes. Turn over the potatoes after a couple of minutes so they get brown on both sides. In a medium bowl, combine the eggs, milk, 1 tablespoon of cilantro and season with a little salt and pepper. Reduce the heat of the frying pan to medium low and add the egg mixture. Stir the eggs until they are very softly set, about 3 minutes. Remove the pan from the heat. 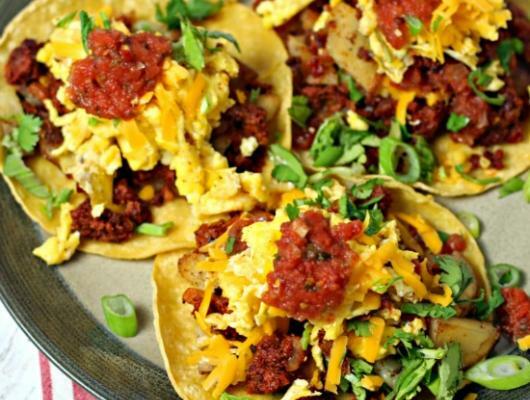 To assemble the tacos, take the heated tortillas and divide the egg, chorizo and potato mixture among them. Sprinkle with remaining cilantro, and then add the cheese and salsa on top. 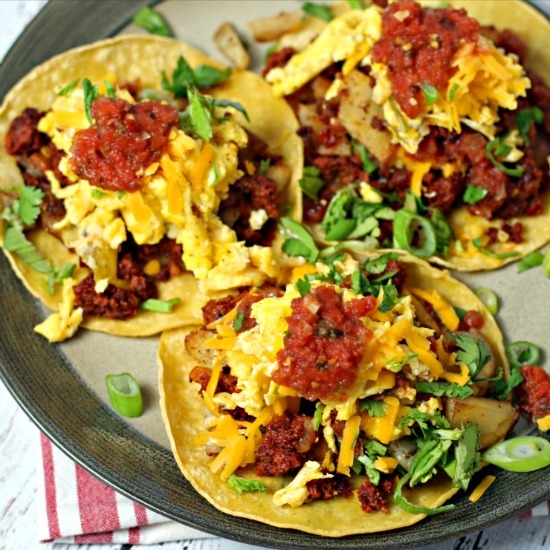 Chorizo Breakfast Tacos with Potato Hash and Eggs are ridiculously flavorful, quick and easy. The perfect meal anytime of day!